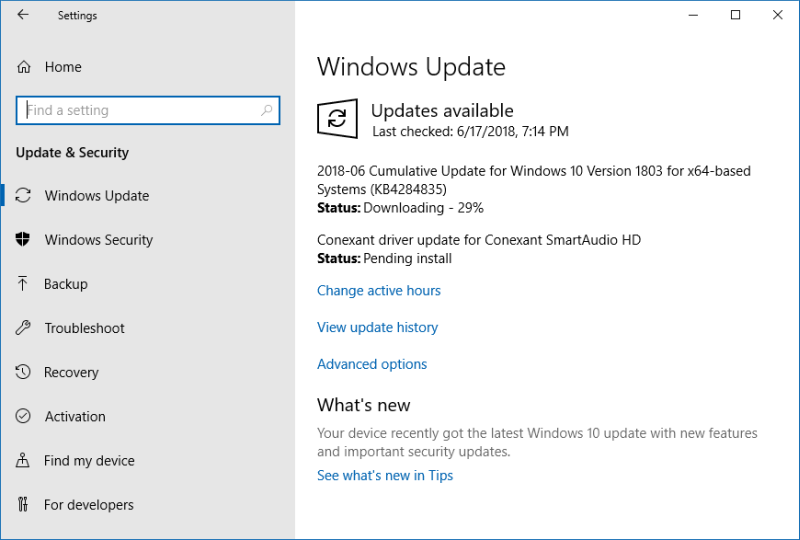 With the release of Windows 10, Microsoft has introduced a number of changes into the Windows Update functionality. Mandatory updates for home users plus reboots (which you can work around), cumulative updates that should save space over time, while also reducing management flexibility, and also, no visible way to hide specific updates. Such a move makes (some) sense for "ordinary" users, but it does not make any sense for advanced users who want to control what they install, specifically drivers but also certain other components. 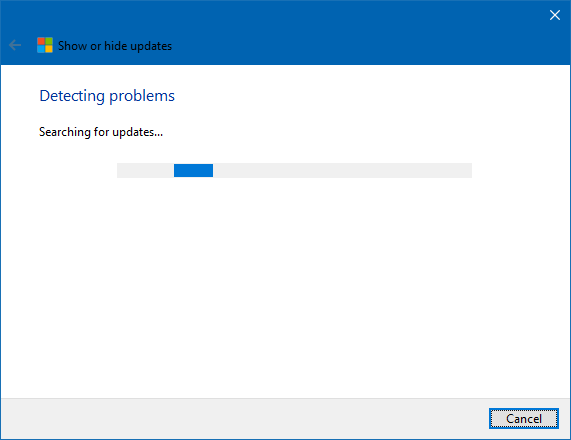 Well, in this guide, I will show you a simple, non-intrusive and official way of handling updates, so you can hide them just like in earlier releases of Windows. The thing is, Microsoft didn't really eliminate the option to hide updates. In fact, most of the functionality that users miss still exists, and can be accessed via PowerShell scripts, Group Policies and registry edits. In this particular case, there's a KB article (and a link to a special tool) that explains how to temporarily prevent a driver update. Toward the end of the page, you will also find Download the "Show or hide updates" troubleshooter package now link. This is what we want. Get it. Run it. Start the tool. It only has one option, so just move on to the next step. It will now run and search for available updates. It will check all existing updates you have previously hidden (if any) and allow you to show them, as well as show you all available updates and let you hide them. Please note that you can run this tool in parallel to the Windows Update service, but there can be an obvious clash of what should run first. Therefore, my recommendation for best compatibility is do the following. In case you have the Windows Update service enabled, stop the service. Please note that Microsoft has also added a new "helper" service to Windows Update called Windows Update Medic Service. What this does is restart the service if it suddenly stops. So it will interfere with your work. You should stop that first before running the troubleshooter (needs TrustedInstaller privileges to be stopped). 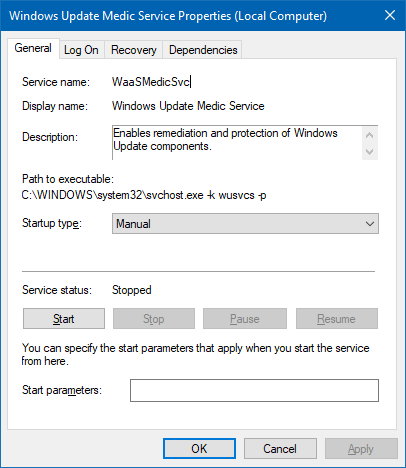 In case you have the Windows Updates service disabled, change its state to manual - but keep the WU Medic disabled, because it will automatically run the updates. Now, run the troubleshooter. If you're wondering how to stop the Windows Update service, then you just need to run the services.msc tool as an administrator. For the Medic and/or if you get an error that prevents you from changing the service state, you will need to run the tool with something like ExecTI, which is a quite useful but also very dangerous tool in the hands of non-skilled users. You've been warned! Run and then let the troubleshooter finish. Once it collects the list of available updates, you will now have the option to show and hide them, as I mentioned earlier. We want the first option. When I tested this, the list included the monthly security update, a plugins update, some Office compatibility pack patches, and an audio driver. But you may be wondering, is this list comprehensive? Well, I decided to check what Windows Update offers, and the two lists did not fully match. 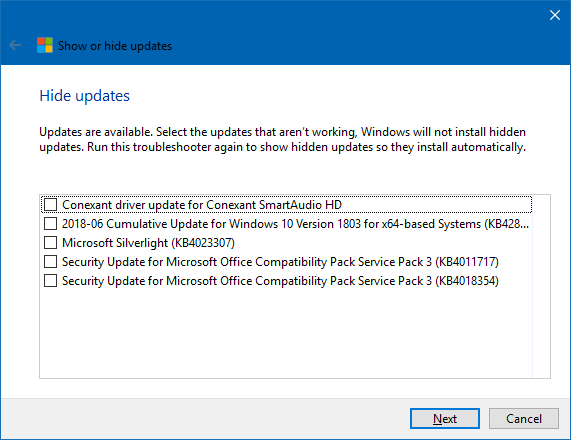 Windows Update only had the cumulative update and the driver, but it did not have the extras. Yes, Windows Update is configured to offer updates for other Microsoft products in addition to security patches. So that's a little odd. 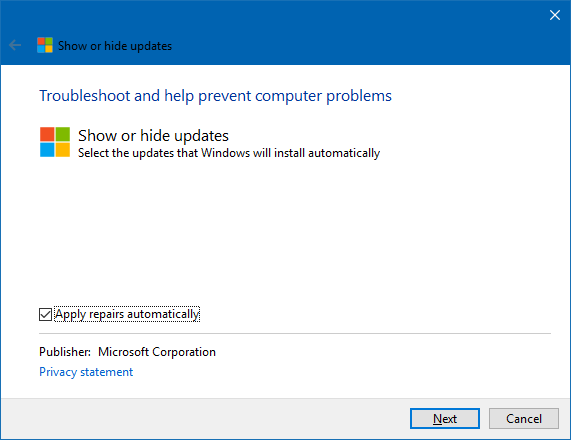 But the troubleshooter has a more comprehensive list, which means you do have control over what gets installed. If the discrepancy was the other way around, it could mean patches being missed by the troubleshooter. The show/hide troubleshooter utility is quite handy, and it works well. 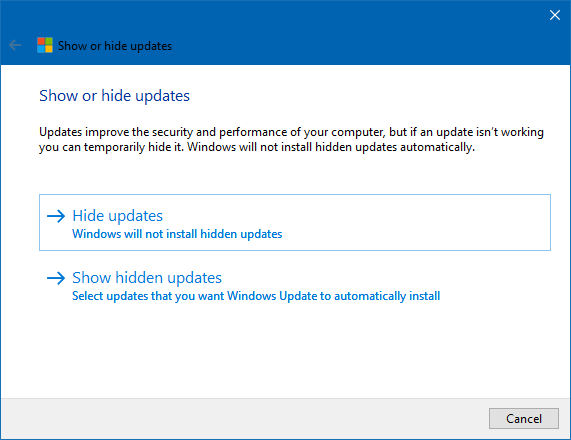 Regardless of your particular Windows Update settings, it will show and display all available (relevant) updates, and give you the option to hide them. It does not list optional products, which you get in Windows 7/8, but then, these will never be auto-installed, so the issue of them showing up isn't really there. All in all, this is a handy accessory for Windows 10 (power) users, and it should give them a bit more control when it comes to updates, especially drivers. In general, my policy is to create a full system image of my production machines BEFORE any update, so if things go wrong, you can roll back. Using the troubleshooter comes handy if you want more selective control, regardless of whatever other mechanisms you have in place. That would be all for today.